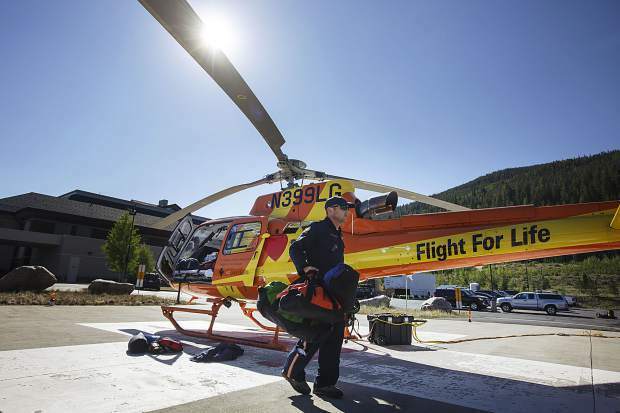 Flight For Life paramedic Tim Baldwin prepares for a flight on Sunday, July 2, at St. Anthony Summit Medical Center in Frisco. Newly introduced helicopter safety legislation will incentivize manufacturers to retrofit older helicopters with hardened fuel tanks. This week, 2nd Congressional District Rep. Joe Neguse, alongside Rep. Ed Perlmutter (CO-07) introduced the Safe Helicopters Now Act in Congress. The legislation will provide helicopter manufacturers with a tax credit for retrofitting existing emergency helicopters with safer fuel systems. "Emergency helicopters and the people who pilot them are on the front lines of some of the toughest times for Americans," Neguse said in a press release. "I introduced this bill to ensure that emergency workers in Colorado and across the country can safely accomplish the tremendous tasks set before them and feel secure while keeping the rest of us safe." The bill was written with help from Karen Mahany, widow of Patrick Mahany, the Flight for Life pilot who was killed in a helicopter crash in Frisco back in 2015. The crash resulted in a fire that claimed Mahany's life and severely injured the two flight nurses on board. Following the incident, the National Transportation Security Board recommended that crash-resistant fuel systems be a requirement for all civil rotorcraft. "This legislation is so critical. It is something the industry needs and wants," said Dave Respher, one of the nurses who survived the Frisco crash with horrific injuries. "What is out there right now in helicopters is ancient in safety and technology. There haven't been any significant safety improvements since the 1960's." So tax credits for companies with the reputation of ripping off their customers. Why would these companies update their helicopters or purchase updated equipment if they think they will get the taxpayer to pay for it. More regulation needed in this industry, not more tax credits. Too bad for the passengers suffering from this greed.